The Stanley Parable, the self-aware game that launched earlier this year, is now available to Mac users. It wouldn't be very fair of developer Galactic CafÃ© not to give Mac users the chance to both suffer and laugh through the antics of The Stanley Parable's narrator. Yesterday Galactic CafÃ© announced its game launched on Mac OSX 10.8 and higher. According to Joystiq, the game will support earlier versions of Mac OSX in an upcoming patch. Players control Stanley in a first-person exploration game to explore not only a mysteriously empty office but also a narrative labyrinth. Both hilarious and a conversation on the idea of choices in videogames, The Stanley Parable is a game of exploration unlike any other and is a story that could not be told the way it is in any other medium. As a part of Steam's first day of the 2013 Holiday Sale, The Stanley Parable is 40% off (making it $8.99) until 1 pm Eastern time tomorrow. Otherwise, the game is $14.99. 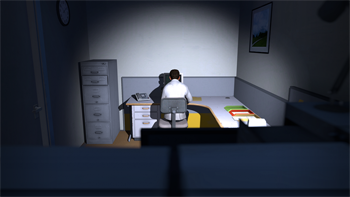 The Stanley Parable is based on a 2011 Source mod by the same developer, now with new content. A free demo is available for anyone who wants to give the game a spin before committing to a decision to purchase it. The demo is spoiler-free for the game and serves to give players a feel for The Stanley Parable -- to experience the style and tone without learning the secrets and twists of the game that are so captivating. Now PC and Mac users alike can experience the full harassment of the game's narrator -- just in time for the holidays.